The Afghan Hound is a loving dog full of life. Although it does not have the intense stamina of other breeds, like Setters or Retrievers, it does have short bursts of energy. It was once a wonderful hunter despite its diva reputation. Although the dog is trainable, it can often ignore calls to come. It tends to do what it feels like at times. Although the dog has a sweet demeanor when dealing with people and children, it may not be the best choice for children because it may not be interested in playing or interacting as much as a child would like. They are known to have the aloft attitude of a cat. They are very independent dogs, yet sweet to their owners. If approached by a stranger, then tend to be very timid. The Afghan Hound requires daily exercise, but not necessarily intense, lengthy workouts. A long walk or a short spurt of intense energy is typically enough to keep this hound in tip-top shape. If your live in a city, this would be a great dog for you to have. You would be able to take it on short runs around the block or you can take a long walk around the city. Its coat, however, is where the real commitment comes in. The Afghan Hound is known for its long, silky hair that requires much maintenance. When it sheds its first coat from when it is morphing from puppy to adult dog, this is when the maintenance is most intense. It will require brushing and combing every day during that period, but once it is an adult, full-size dog, brushing is only needed every 2 to 3 days. This is still a good bit more than other, shorter hair breeds. Also, this dog is definitely an indoor dog and does best if it has a soft, comfortable bed to rest on. Health concerns for this dog really fall in the minor concerns category rather than the major concerns category. Overall, the Afghan Hound is a healthy breed. They are known to get cataracts later in their lives so if you notice your dog having eye problems that include itching or scratching at their eyes, or perhaps not being able to focus like they once did, you may want to make a visit to your vet to get them checked out for cataracts. Other issues that may occur with this breed is chronic hip dysplasia and necrotic myelopathy. If you notice any symptoms, like your dog having trouble walking, climbing or descending steps, or getting up after sitting, then you may want to have your dog tested for these things. It is recommended that it gets eye and hip tests once every year or at least once every other year to keep a good track record of the dog’s health to ensure its health is maintained. Their roots date all the way back to the Egyptian pharaohs, and they were derived from the Middle Easter sight hounds. It originally hunted hare and gazelle meat with the aid of falcons that were trained to swoop down at their pray. Centuries of this dog hunting amongst mountainous terrain in Afghanistan eventually ended up producing the fast dog with great short stamina that is reflected today. Its long coat played a huge part in keeping it warm in the cold mountains. 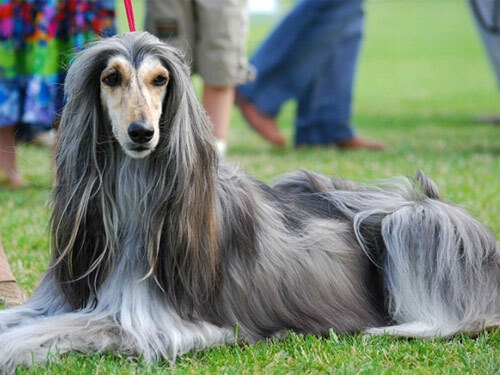 In the 1900’s is when the first Afghan Hound came to England where they were referred to as Persian Greyhound of Barukhzy Hounds. In 1970, the Afghan became a trendy breed but has since dwindled in popularity.